Questions like these often come to mind while travelling the Arctic, specially as vegetation which is usually covering bedrock is scarce here, thus allowing to see the rocks, the »backbone« of all landscapes. Many processes left their traces during the course of earth history in the various landscapes we are travelling today. These landscapes provide the background of today’s ecosystems, there we can find the wildlife and all the flowers we enjoy so much, and they set the scene for the exciting history which has taken place. Literature answering those questions is scarce: scientific literature is not very useful for those among us who have not studied geology or physical geography, and general guidebooks usually only show that the author is not interested in the subject. One of many figures in my book. It is explained why the mountains at the west coast of Spitsbergen are wild and alpine whereas they are plateau-shaped in the east. Further information, telling the story behind the structures of the rocks, is given in the text. I try to fill this gap in literature, giving some basics and then a lot of information specially for the areas we are travelling: Svalbard and East Greenland (from Kejser Franz Joseph Fjord in the north to Kangerlussuaq in the south). 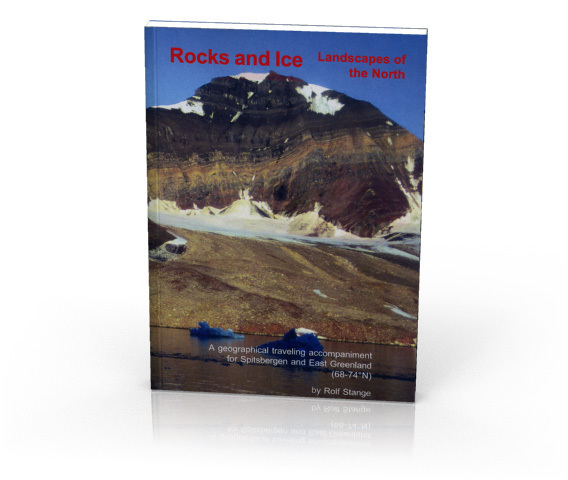 The book is illustrated with many b/w fotographs, maps, figures and colour plates, making it easy to read, although the amount of information makes it interesting even for trained geologists who are not yet familiar with the area (→ Geology of East Greenland). Having the German version »Steine und Eis« out now since spring 2003, the success it already enjoys encouraged me to have it translated it into English. Now it is available!